Action Figure Updates: New Old-School Toys! We have some quick news items from the world of action figures. First, the expected big reveal of the MEGO revival that was supposed to happen at the Long Island Comic Con last weekend did not take place. It’s not bad news. Basically their retail partner, who has an exclusive on the line until next year, wanted to be the ones who break the news. This will happen early in July. What we did learn is that there are to be 70 figures (of various sizes) in the line, and they’ll be sold exclusively, at first, through a single retailer. I have a guess as to who that is, but it’s just a guess, so it’ll remain unwritten here. I’ll let you know if I’m right or wrong when they do spill the beans. The exciting thing is that the retail partner will have the first wave of figures for sale in August, and MEGO will be selling them in San Diego. This is really happening, folks. Keep reading PopCult for the latest updates. Also really happening is a new line of Captain Action uniform sets, as reported by Dan Johnson at 13th Dimension. 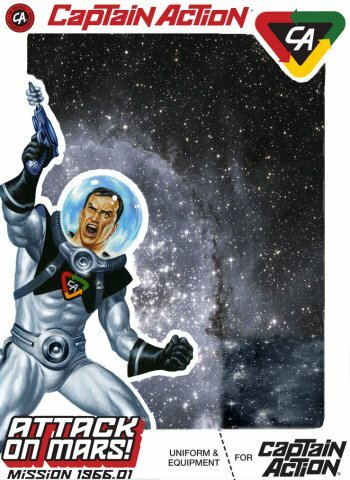 Follow THIS LINK to the full article, and then get real happy because, in addition to the way-cool and fifty-years-overdue Spacesuit for Captain Action (shown at the head of this post), Captain Action Enterprises is promising a whole line of outfits based on superheroes who were never part of the CA line before (and even a suit for Dr. Evil). All the new uniform sets will feature gorgeous painted art by the legendary Joe Jusko. Finally we have figures that I actually have my hands on already. The New Heroes of The West is a new line of custom figures based on the classic Marx Action Figures like Johnny West. The creation of Scott Stewart, James Wozniak and Dave Johnson, this line will make use of new reproduction bodies as well as some original Marx bodies, and will focus on the vital historical periods of the old west including; the Texas Trail Drive Adventure, the Black Hills Adventure, the Colorado Gold Rush Adventure and the Western Territory Adventure. Each series will have several figures, animals and other fantastic accessory sets. 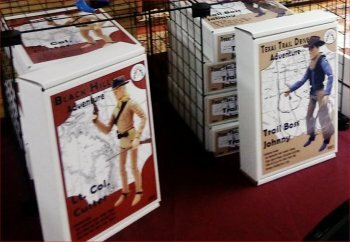 The figures will include historical figures, banditos, badmen, drovers, Indians, cowboys and a host of other historically accurate men and women. Being introduced first are Trail Boss Johnny and LTC Custer each with unique custom accessories and the other accessories you’ve come to know and love but in new color combinations. Also two new dogs are available; Kotah and Mavrick. I bought mine in Wheeling a few days ago, and I’ll post a detailed review in a couple of weeks, but…spoiler alert…I love these guys. These sets are issued in very limited numbers and will come with new boxes and individual equipment manuals. Custom heads, accessories and sets will be interwoven into these sets to give them truly unique characteristics. They expect to release a batch of new figures every three months. Follow The New Heroes of The West on Facebook to keep up with the latest news. It’s looking like the Summer of 2018 might just turn out to be a bit of a golden age for classic toy revivals. That is all such great news Rudy! !